Flatiron and Midtown West have seen dramatic neighborhood price increases over the last 90 days. And surprise, surprise, sales in One Madison and the uber pricey, uber tall One57 are the two forces driving the change. Azad Ali talks about two decades spent preserving and restoring old homes in Prospect Park South, Ditmas Park and Midwood in Brooklyn. Fans of Breakfast at Tiffany’s will want to check out the $10 million listing for that little townhouse where fictional Holly Golightly entertained her many suitors. Learn about Mexico-born Ismael Leyva, the workhorse architect who has risen to prominence designing interiors for Related Companies projects like One Carnegie Hill, the TriBeCa Royale and The Brompton. 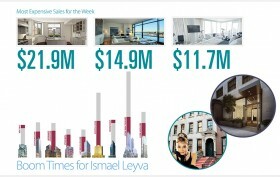 For market trends, cool listings and interesting tidbits about New York’s most noteworthy buildings and neighborhoods, we turn to CityRealty‘s Weekly Market Snapshot for the scoop.